A Jolly Good Show ! Stand agog whilst he tries to get the old girl back into the air! Crikey chaps, watch out in the sun! — Glyn Tooley Sky Kite Festival wales . The King of Carnival! Juan exudes the spirit of South America Rio with his big heart and love of dance and bubbles, a frothy cocktail of bubble workshops, spinning plates , ribbon dancing, marakas and tambourine playing. You don't believe him? see him in action. Everyone absolutely loved Juan! we haven’t had dancing in the streets in Carmarthen since VE Day! Everybody loves bubbles! Especially when they are made by the Maestro himself. He’s looking for a new members to join his bubble orchestra, with a wave of his baton he’ll have them all making giant bubbles in time to glorious music from his musical bubble trike. 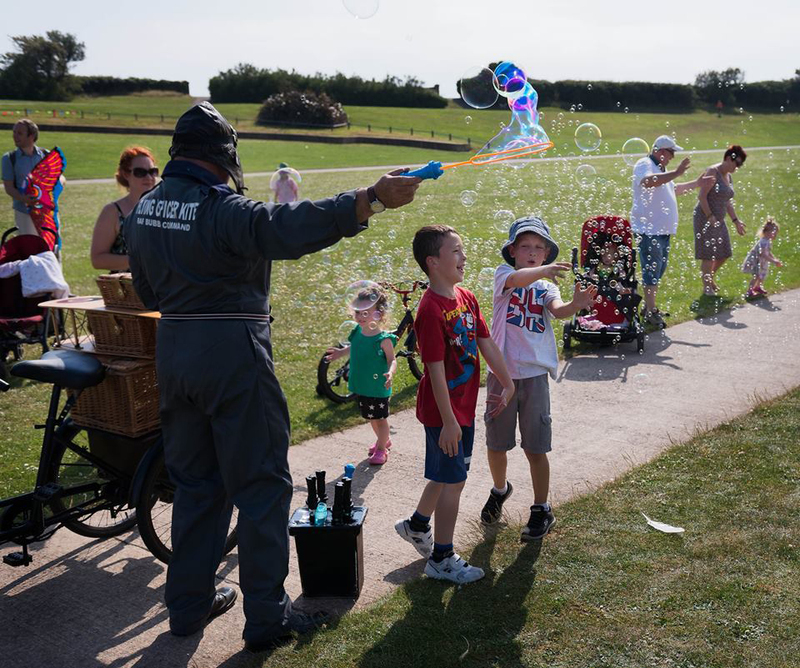 He's got big bubbles, small bubbles, hula bubbles, bouncy bubbles, flying bubbles and bubble workshops, games and competition for all and all the fun of the fair in a glorious circus and bubble show and driveabouts on his Musical Bubble Trike . Glorious 35 minute show and 2 x45 minute Bubbleabouts. Pontycanna Jones and the Raiders of the Lost Archive! "Ponty! " as he is known, is on a quest and fortunately he's blessed with Super Powers but he'll still need the audience to help him! Thrill as our lovely boy battles evil to save the day. There's a recipe see, written long ago ......... hidden it is , far from the hands of the sworn enemas of the Welsh, those dastardly Inglisi, and that recipe is the secret of the pasty that made this nation grate, if only someone could find it and save the day! Well, he might,, some day soon, just by here , but only if he can get some help to : Run away from giant bouncing balls of doom, solve the puzzles , read a map (for he is truly awful at maps ..) fight the giant snakes and rats and capture the baddies . A 5 to 35 minute show with 2 x 45 minute walkabout whip cracking workshops ! Any resemblance to Indiana Jones is a pigment of your imagination and should be treated by a doctor for it !